Today’s the big day, when Kleeschen (also known as Saint Nick or Sinterklaas) comes to town to leave gifts for all the good children … and when Housécker brings a bit of wrathful justice to the bad ones. 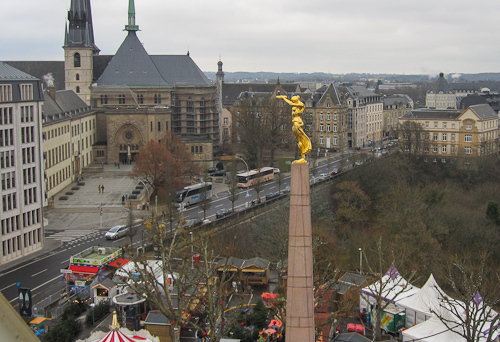 If you’re looking for more words, revisit last year’s post about Kleeschen’s arrival in Luxembourg, or read The Wort’s summary of the tradition. This year is all about the holiday ambiance here in the Ville. 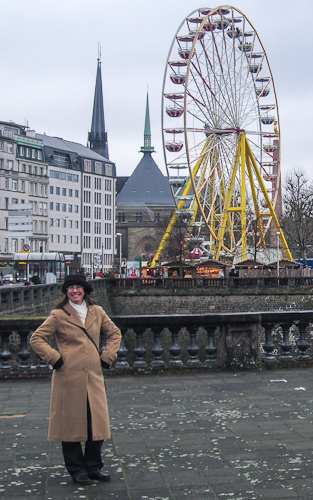 And the first order of business was to ride the new Ferris wheel at the Christmas Market! 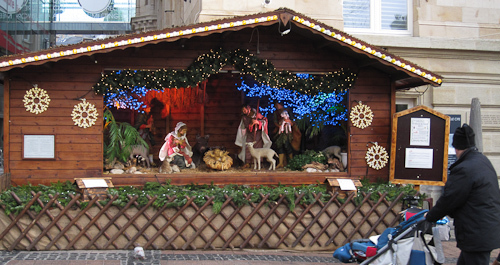 This was a close to Kleeschen as we got this year — he passed us on his way from the train station to another town. He sat in the jump-seat where parents usually sit with their strollers. The rest of the bus was full of his attendants. 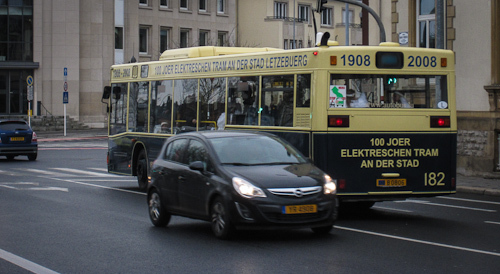 Anita saw him right away, pointed at the bus, tugged my sleeve and said, “Kleeschen! Kleeschen!” I thought she’d lost her mind, so I missed the photo opportunity. 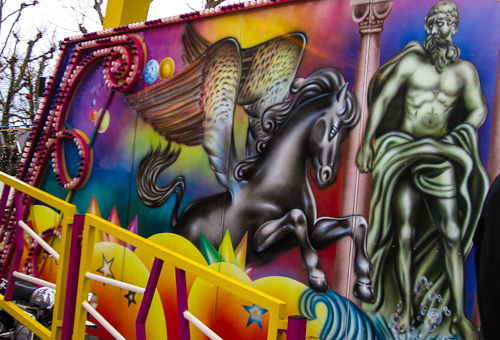 The traditional unicorn and Greek god of the Christmas Market were there to send us up into the sky on the Ferris wheel — of course! Lovely views. I hope we get a chance to ride when there is snow on the ground. Not your typical perspective on the Gëlle Fra. 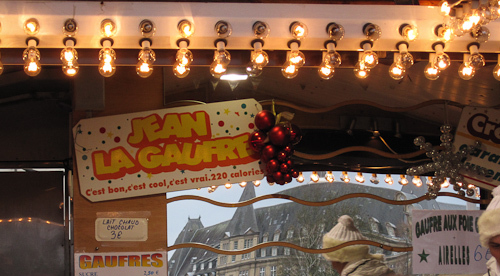 Jean La Gaufre is, for many, the highlight of the Schueberfouer in August, and then it returns to Luxembourg for Christmas. Yay! “It’s good. It’s cool. It’s true. 220 calories.” Boy, those Belgians are good at marketing. 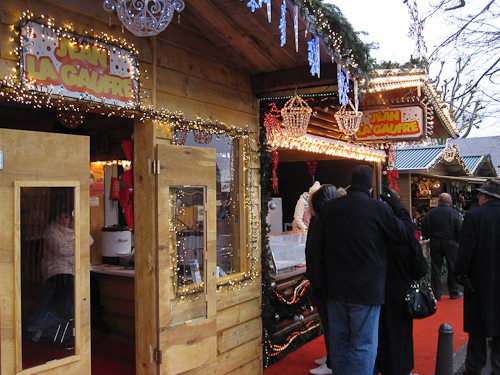 There’s a whole new area of Christmas Market to explore this year: the parking lot surrounding the Gëlle Fra. The woodchips were a nice touch, and they actually worked to make it feel less like a parking lot. There is ALWAYS an Irish pub. Always. 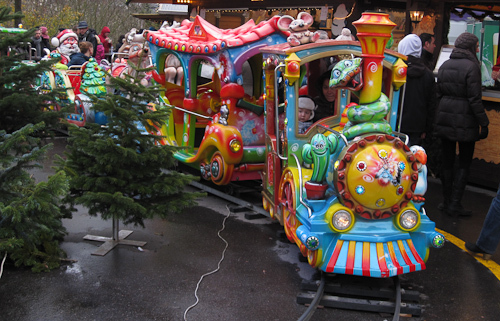 The Train of Too Much Holiday Decoration on its short route. I choose to interpret this Vehicle of Awesomeness as a John Deer tractor. 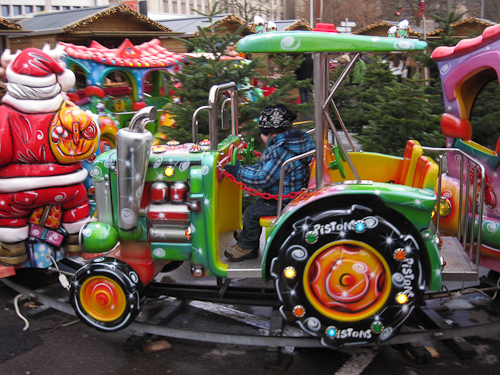 Did you know that there is a lot of John Deere equipment in Luxembourg? Honest! These very nice people, Marianne and Roger Gleis-Ries, sell a gob-smacking variety of things made with honey. They are also very eager to tell you about their honey products. 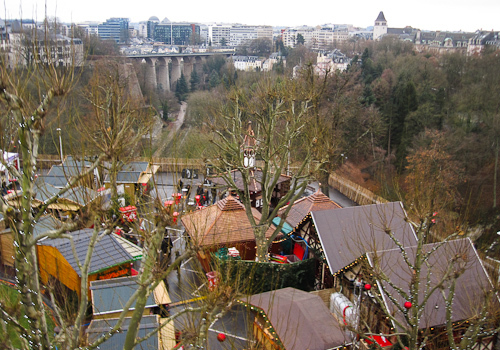 The new area of the Christmas Market focused on local producers and artisans. Earlier in the year, we heard about the Mayor’s plan to make the chalets more affordable and accessible for small businesses. Anita and I like the results very much. 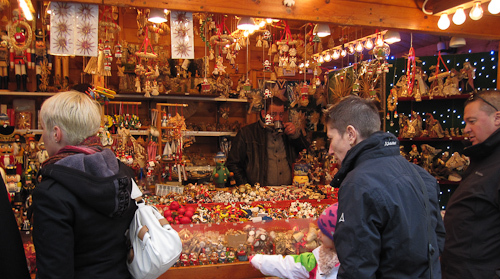 The Place d’Armes is the traditional site of the Christmas Market, and it’s the same as we’ve always known it. 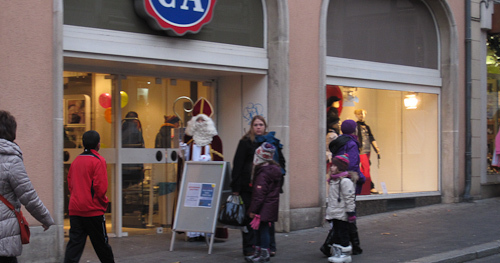 There are plenty of the usual merchants, filled to overflowing with geegaws and whatnot. 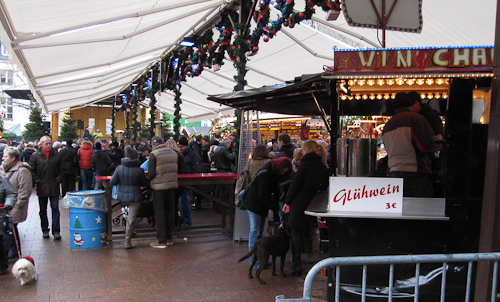 The most important feature of the Christmas Market is the Glühwein. The central, covered area in front of the bandstand is still the place to meet. I hope that doesn’t change! A nod to the traditional reason for the season. These flat brown things are gromperekichelcher. I recommend The Wort’s video report on this local delicacy, if only to hear how the word is pronounced. While walking around the Ville, you may see what appear to be multiple Kleeschens. (What is the proper plural: Kleeschenen?) Do not be fooled! These are department-store knock-offs. Here you can see that local residents know better than to pay attention to this impostor. They know that the real Kleeschen was taking a boat trip on the Moselle at that moment. 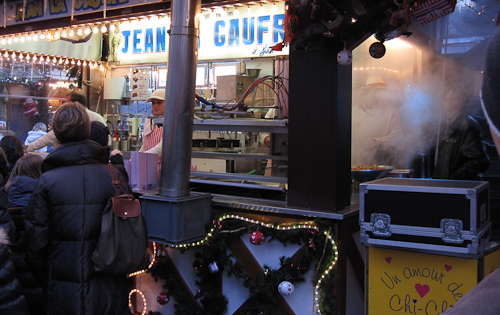 Locals know that there are multiple Jean Le Gaufre stands, and that they are all genuine. 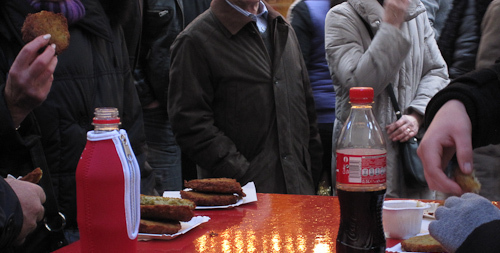 This stand sells Chi-Chis, which are closely related to churros — and they are Anita’s favorite. She always stops to get some on the way home. 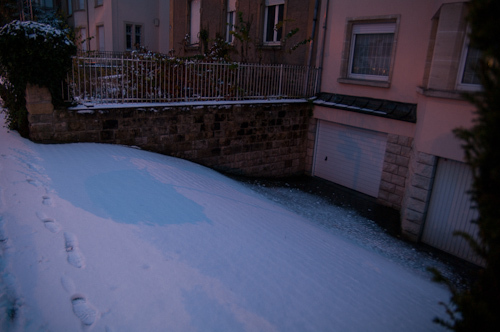 A few days after our first visit to the Christmas Market, we got some real snow cover in the Ville. I couldn’t get away from work until late in the day, so I only have a few photos to share. 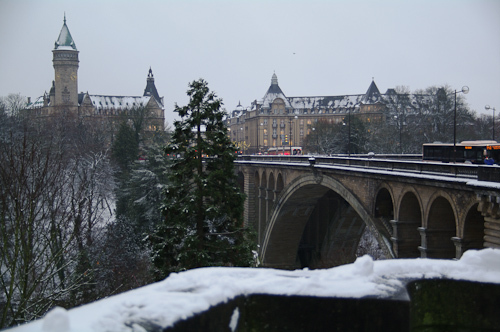 I’d have liked to taken pictures of all my favorite spots in Luxembourg. I’ll just have to hope for snow in January this year. 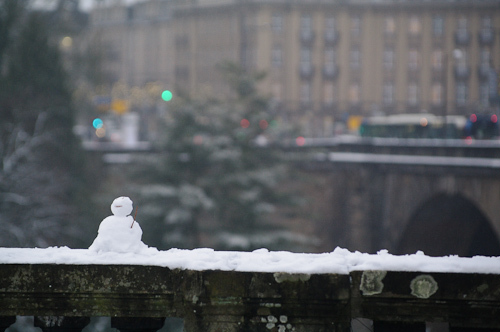 Who doesn’t feel whimsical on the first snow of the winter? 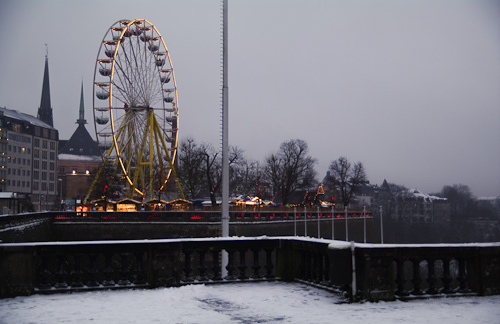 It was dusk by the time I got close to the new section of the Christmas Market. 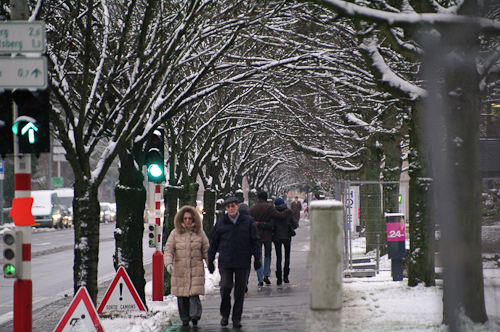 The Petrusse valley can seem drab in the winter, but then it wears snowfall like a ball gown. 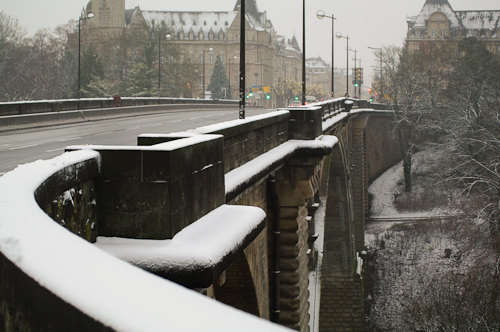 The obligatory shot of the Spuerkeess and the Pont Adolphe. All the driveways in our neighborhood are this steep. I would be nervous every time I drove up or down. 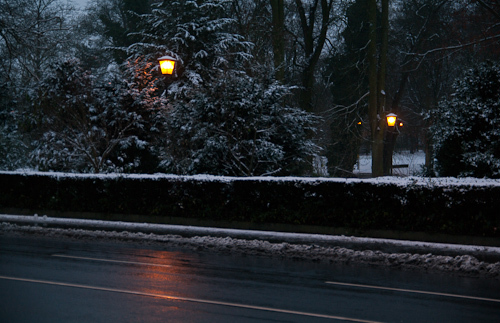 It doesn’t look much better when it’s cleared of snow! One last photo before it all melted overnight. So where is the picture of the redrumwinefireshot? 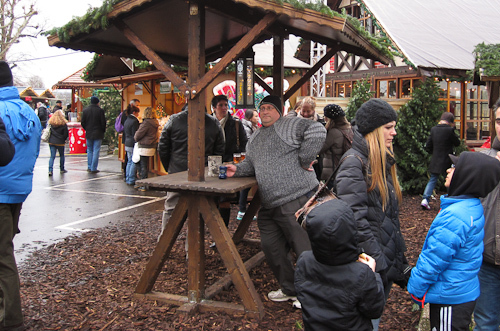 Or the usual shot of Will sipping Gluhwein? What in heaven’s name is the art on this year’s souvenir boot?! Sigh. Fear not! It is still early in the holiday season. 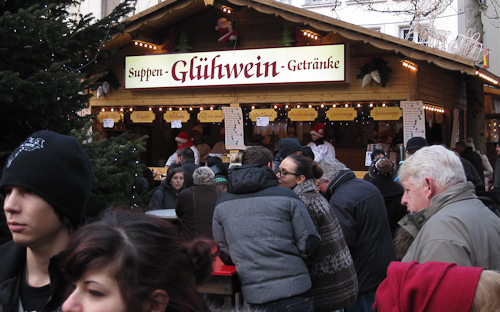 When we did the first trip, we were both recovering from gastroenteritis and mulled wine didn’t seem like a good plan. 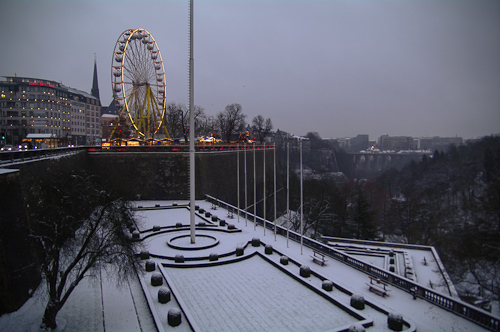 But, we’ll be sure to document the new boot and get a shot of Will with the Gluhwein as soon as the snow stops. 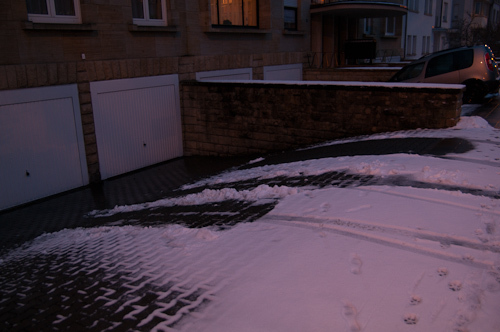 Those driveways are tricky! I don’t think we’ll take our car out today.